What does Dinesh D’Souza’s visit to campus mean for the community? Is Dinesh D’Souza an idiot? Well, yes. He’s a professional provocateur, a man who made his name selling sensationalized political documentaries and, let’s not forget, committing a felony for which he was sentenced to eight months in a halfway house. D’Souza has every right to speak, of course, but I wish that the Dartmouth College Republicans would choose their speakers more wisely. Are pseudo-intellectual provocateurs like D’Souza and David Horowitz really the best representatives of conservativism? I’m no conservative, but I know a number of thoughtful, intelligent people who are, and I see little resemblance between them and such characters as D’Souza and Horowitz. It’s as if the Dartmouth College Democrats brought in self-professed radical socialists; it would make a mockery of true liberalism, just as D’Souza’s fear-mongering proves an embarrassment to conservativism. I’ll give the College Republicans the benefit of the doubt. I suspect that they intend this as a test of the College’s commitment to free expression, just like when they brought in Milo Yiannopoulos, perhaps the most extreme right-wing provocateur out there. Though I question the need to push limits like this, I don’t deny the critical importance of allowing speakers to air their views. I may not agree with what these speakers espouse, but they by all means have a right to speak; if there’s one thing students all ought to agree on, it’s the foundational importance of free expression. Of course, free expression goes both ways, and people have every right to criticize speakers like D’Souza. I’m certainly critical of him. But in criticizing him, it’s important that he is given the chance to speak. Dinesh D’Souza spoke at Dartmouth last night. The First Amendment gives him this right. What he does not have the right to is the meaning of his words for his audience, because meaning is not a right under the First Amendment. Often, his words are disparaging and hurtful for anyone who does not agree with and/or identify with the Republican party he is a member of. When there are people who have died for the right to speak as a citizen of their own country, it seems unbecoming to use that right for hateful purposes, and so it is left to D’Souza to decide what his purpose will be and with what words he will express it. D’Souza’s invitation by the College Republicans signals the degree of alienation that the group feels from the broader Dartmouth community and the degree of support and reliability they believe to have within their ranks. D’Souza was a controversial figure while he was a student here, and his career has continued along a similar trajectory full of fear-inspired vitriol and contradictions. I’m sure that he genuinely believes his brand of conservatism to be the best way to energize the Republican base, but I think that were he to take a moment to listen to anyone outside of his bubble he would realize that politics of hate and mistrust are no way to organize a society, nor bring people together. Content aside, Dinesh D’Souza’s talk was a flimsy one. It touched on too many subjects at once to say anything substantial, and if an idea was followed to its logical end (which rarely seemed to happen), its path was a convoluted one. This point was noted during the Q&A portion of the talk by an audience member. D’Souza then acknowledged the decentralization of his talk, but defended its fragmentation by saying that this was likely the only time that many of the audience members would be exposed to views such as these. He had to pack it all in. This means that on this campus, when shoddy argumentation purports a controversial message, both the structure and the content are justified by the fact that they are “unique.” Does this then mean that the College should accept (and fund) speakers who don’t do the intellectual legwork to craft solid arguments simply because what they are saying is uncommon? Perhaps the real reason students are so seldom presented with arguments like D’Souza’s is that they are so easily dismantled. What we have here is a conservative speaker, with a great many controversial statements, views and past actions, coming to this campus to speak to students at a promoted event. On the one hand, this could merely be an opportunity for the College Republicans to gain publicity and exposure through a provocative visitor in the hopes of furthering the conversation on campus, and benefitting Dartmouth’s closet-conservatives by showing them that they are not alone in their views. On the other hand, this event may be a statement by the College Republicans to deliberately divide our campus even further, lessening the opportunity for the advancement of open-minded, rational and tolerant discussions. I believe the intention was the former, but the more probable result is the latter. Bringing a speaker with a problematic past and views situated at the far end of the spectrum might not be the best way to create an environment conducive to open conversation — and this is the bigger problem at hand. Dartmouth is a campus with a liberal bend, getting uncomfortably close to a consensus that works against many students’ cherished free speech. What all sides of this campus should be working toward is not promoting their own views, but instead encouraging a better atmosphere for each other: one in which students can speak their minds within an accepting setting and learn from the ensuing conversation. Dinesh D’Souza will not help this cause. The D’Souza talk will mean little for the Dartmouth community because D’Souza and his protesters cared more about cultivating their personas than exchanging their ideas.The political theater of the progressive protesters was clear: They wanted to be seen decrying and disrupting a “fascist” speaker. They also hoped he would tacitly admit to his “bigotry” or “shame” or other deplorability in front of an audience. D’Souza’s political theater was subtler but equally counterproductive for campus discourse. As D’Souza’s self-promotional video at the beginning made clear, D’Souza wanted to be seen as a rogue intellectual fighting progressive censorship of the truth. He opened the event with an analysis of “The Road Less Traveled” by Robert Frost to give the event a veneer of intellectualism, but his speech was too unstructured and incoherent to adequately explore any of the issues he touched upon. He chose to compete with protesters for “gotcha” moments at the expense of many curious students who had good questions about the substance of his work. In short, the talk was not an intellectual discussion of historiography. Unfortunately, this event was nothing more than self-reinforcement for self-proclaimed culture warriors who debase our discourse. Dartmouth College’s allowance of Dinesh D’Souza’s address illustrates the administration’s continued commitment to diversity of thought and the challenging of popular opinion. Notwithstanding the various layers of problematic content D’Souza promulgates, the College should be applauded for its valiant goals. Although one can wish the idyllic, accepting, inclusive Dartmouth community could be entirely representative of the broader world — it simply is not. Dartmouth students must learn to exist in a polarized environment. Part of that education is identifying which beliefs make us uncomfortable, and mastering the art of protest and productive discourse. Without a conflict of opinions present on campus, such an exploration will not exist. 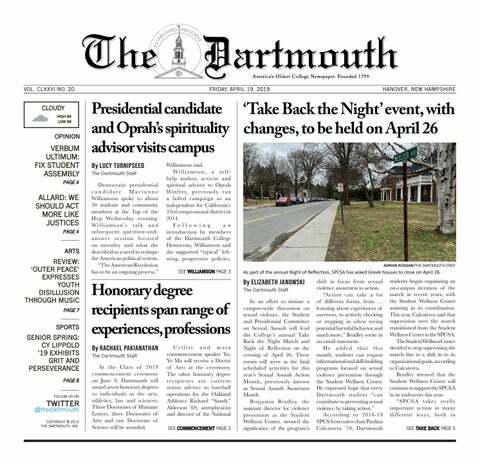 After the visit of two controversial Republicans in less than two terms, it is clear the administration isn’t changing its tune too soon — so what does this mean for Dartmouth moving forward? It is crucial that we have systems in place at Dartmouth to make the presence of controversial guests a learning experience, rather than a divisive one. It is indisputable that D’Souza’s comments personally targeted a great part of our student population. We must have forums for groups to gather in solidarity, pages to post our thoughts and accessible, non-biased conversations.